and for me that means hunting season! The sale consisted of both the house and the garage. In the house I found 2 lovely little trinkets. The first was this Oh So Cute green Slag Glass vase. It's just perfect for my Lily of the Valley once they are in bloom. Next I found this vintage floral scrapbook. major dig in the garage. were hanging on the garage wall. They are in fabulous condition for their age and were the envy of all the other treasure hunters including the Sister-In-Law. Thanks to a very helpful gentleman who dug them out of massive piles of ummmmm... stuff! Thank you sir wherever you are!!! In the end we only found 3 chairs. My guess is somewhere in that garage there still exists one more yellow chair. I hope wherever it lands, it's as cherished as these are. which is now located on Route 112 in Medford, NY. This was the first time I visited this thrift store since it moved from Port Jefferson, NY. It's a great new space! dainty lil' yellow shoes with a bow on top. They are reminiscent of 1940's shoes with the peep toe styling. I also found this vibrant aqua & orange paisley scarf. I truly love finding vintage scarves on my treasure hunts which brings me to our last stop. 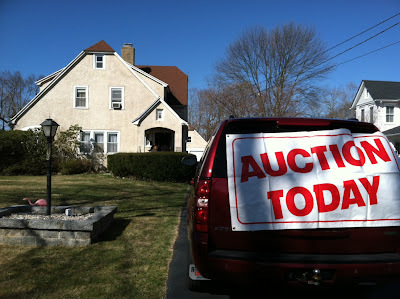 Early on a chilly Saturday morning we headed to an old house in Sayville, NY to a house auction. This was the first time I had been to an estate auction in a house. I was there more as an observer and student and boy did I get an education! There were 3 items I was interested in. second a huge white wicker plant stand with an arch over it for hanging a flower basket or a bird cage. Lastly, there were 4 drawers FULL OF VINTAGE SCARVES! were in different rooms of the house. While Wendy did a super job at moving quickly through the house, I just didn't have the time that day to stay. It would have taken a long time to get to each room and payment was expected at the completion of the auction. Time just wouldn't allow for it. If you are in need of household items, trinkets and treasures, I fully recommend one of WENDY'S auctions. You will spend pennies on the dollar compared to other venues.